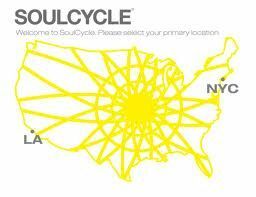 SoulCycle is the latest fitness craze to hit LA courtesy of our East Coast neighbors! It has a major cult following, and is the staple workout for some of the most toned and fit celebs like Kelly Ripa, Brooke Shields and Katie Holmes…just to name a few! 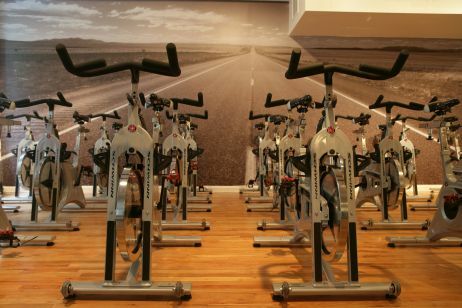 All SoulCycle classes are 45 minutes in length, except for the 60 minute SoulSurvivor class. 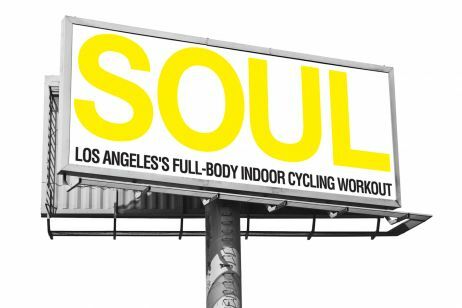 SoulCycle WEHO is located on Sunset Blvd next to Equinox. Classes fill up extremely fast, and classes can only be reserved up to a week in advance. Lockers are available for use prior to the class and are free of charge. Water is available for purchase, and hairbands and gum are complimentary (a great perk)! Be sure to arrive a few minutes early and don’t forget to have your parking validated. When I heard SoulCycle was opening up in LA, I was ecstatic! I have been several times to the New York locations when traveling on business and was so impressed with the caliber of the class, AND the bright and welcoming nature of the studio. I was thrilled to find that both visually and physically, the studio in West Hollywood is a carbon copy of the studios I visited in New York. You can’t help but feel energized and ready to spin when you walk into the place. Bright white walls, some of the hippest spin attire I’ve ever seen, and a smiling and bubbly staff greet you when you walk in. You are then ushered towards the locker area where you can store your stuff for free. Finally, you enter the studio, dark and lit only by LED candles. You can pre-select your spot in the room, and it’s easy to find your numbered bike. After grabbing some light weights and clipping in, you’re all set. As soon as the music starts pumping, you are up and out of the saddle, spinning like crazy! The energy in the room is great, and the instructors keep you moving non-stop for 45 minutes (which ends up being plenty of time to spin considering the accelerated pace of the class!). The only “break” you take, is a 10 minute breather where instead of just sitting and spinning lightly, you incorporate upper body weight training. With so much activity, the class is over before you know it! I can’t imagine someone not enjoying a SoulCycle workout. Give it a try…first class is $15! I like to spin and had heard a lot about this new spinning craze that was making its way to WEHO. I took my first SoulCycle class, and would have to agree, it was unlike any that I had taken before. The class is only 45 minutes in length and the instructors make to sure to not waste a single second. Frequent water consumption is encouraged, but breaks are not. The majority of the ride is out of the saddle, and I can definitely say that my calves can still feel it. The atmosphere was perfect, dark room, loud high energy music and a room full of people that wanted to sweat! SoulCycle is not for the faint of heart but that being said, you should always go at your own pace. What make this class stand out from others, besides never sitting down, is that they incorporate a strength training portion into the 45 minute workout using 1 or 2 pound weights. The only downside is the cost, but class packages are offered.